Luxury and adventure are synonymous when it comes to Land Rover! Designed to be as good on-road as it is off-road, proper care and maintenance are essential to keep your rugged beauty in tip-top condition! High-end vehicles deserve high-end service. At the iAUTOHAUS BOSCH Authorized Service Facility, our Land Rover specialists have the expertise to handle any luxury automotive service or repair you bring our way. Whether you have a Mercedes-Benz, Porsche, Volvo, Bentley, or a range of other select and foreign models, the iAUTOHAUS European automotive experts have the proper tools, equipment, and experience to get the job done right. If you are looking for a Land Rover mechanic in Arizona that specializes in certified Land Rover auto repair, look no further than iAUTOHAUS. The iAUTOHAUS Service and Repair Center in Tempe Arizona can help you with all your Range Rover, Range Rover Sport, RR Evoque, LR3, or LR4 needs. Our clean and modern facility houses the latest factory diagnostic equipment and we only use quality factory or OEM parts. Our friendly and knowledgeable Service Advisors are here to assist you whether you require keeping up on your Land Rover maintenance schedule, minor or major repairs, need to diagnose a check engine light or just an oil service. Our Master Technicians have collectively over 100 years of Exotic auto repair experience. Visit our Land Rover repair shop in Tempe, Arizona and receive the care your luxury car deserves. Choose iAUTOHAUS as your complete luxury Land Rover care provider. Call 480-317-0783 or book your Land Rover repair service online today! Quality workmanship from our European auto mechanics along with prompt, courteous and knowledgeable service. Our experienced European auto repair center in Tempe, Arizona offers affordable prices. We offer a 24 month/24,000 mile warranty on all parts and labor. Your car receives complimentary handwash and vacuum every time! We also offer free shuttle service, free towing with certain repairs, discounted car rental and more. We have a clean, comfortable waiting area with free Wi-Fi and a flat-screen TV. Our family-owned facility employs highly trained Land Rover technicians to get your vehicle fixed right the first time! Check out our monthly service specials! We also make it easy to pay for unexpected repairs on your Land Rover, with 0% interest OAC financing for 6 months with a BOSCH Service Credit Card. If you’ve searched “Land Rover repair near me” or “Land Rover service near me”, Give the Land Rover certified repair experts at iAUTOHAUS a call today. If your Land Rover is experiencing issues, our ASE-certified technicians will get you fixed up right the first time and back on the road right away. Our Land Rover technicians will assess the problem and let you know what to expect. Simply call 480-317-0783 or book your Land Rover service in AZ online today. Check out our current service specials going on now! Ready to take the adventure up a notch with a newer or different model Land Rover? Or perhaps consider a completely different make of SUV? Visit our Sales Department to explore the possibilities. With new inventory arriving weekly, we are certain you will find something to keep your driving expectations as exhilarating as possible! Competitive Financing is available OAC as well as quality extended warranties. You will enjoy browsing in our indoor showroom and our knowledgeable Sales Professionals will make your buying experience easy and enjoyable! 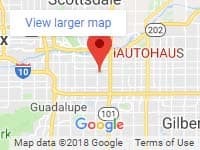 Family owned and operated, the entire iAUTOHAUS in centrally located in Tempe, with easy access from Scottsdale, Phoenix, Ahwatukee, Fountain Hills, Chandler, Mesa, and Gilbert! We look forward to the opportunity to serve you!